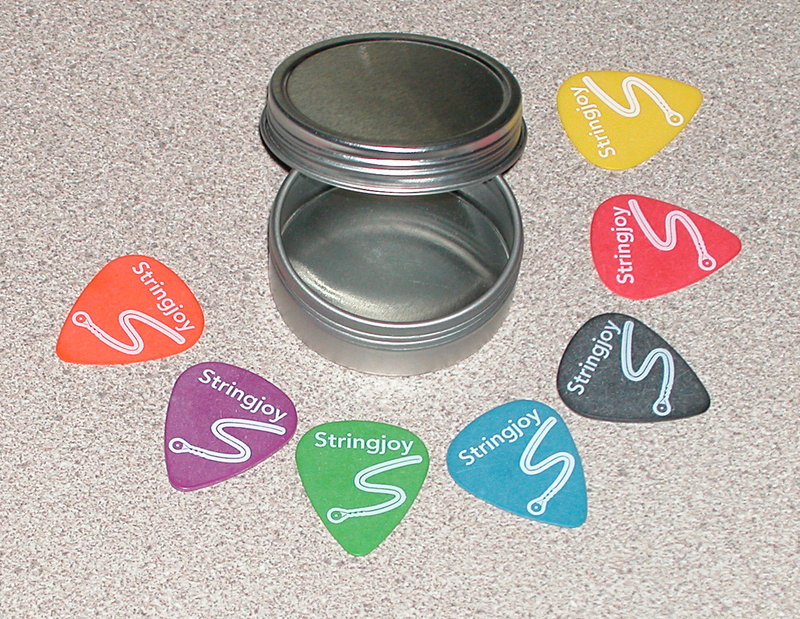 DIY Handmade Embedded Artwork Guitar Picks! 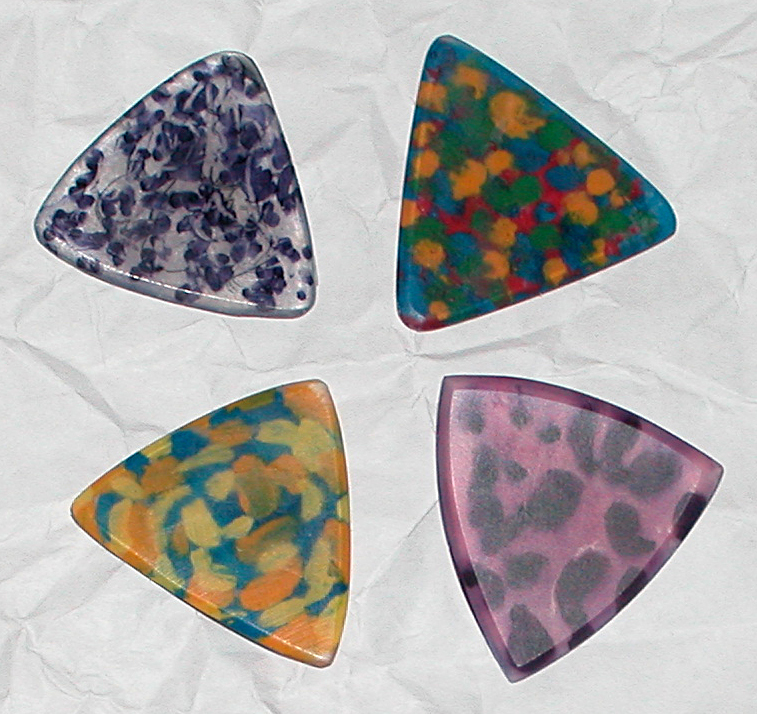 I made these guitar picks myself. 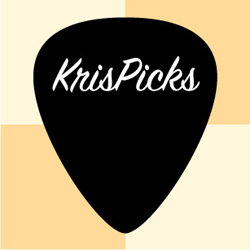 They are one of a kind, handmade guitar picks. 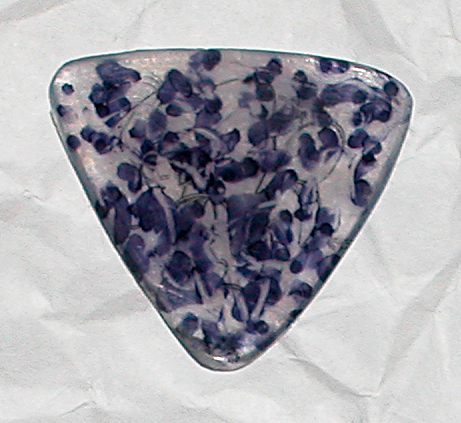 The artwork is inside the pick, which means the artwork won’t scratch or wear off. 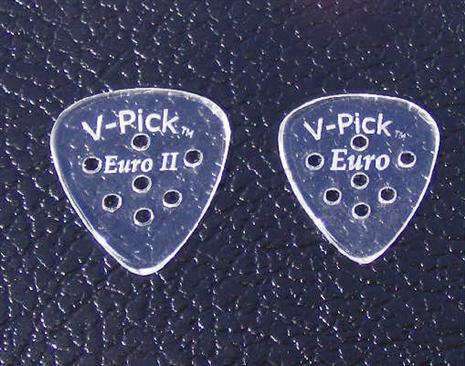 I found the information on how to make these picks from the Pick Punch web site. 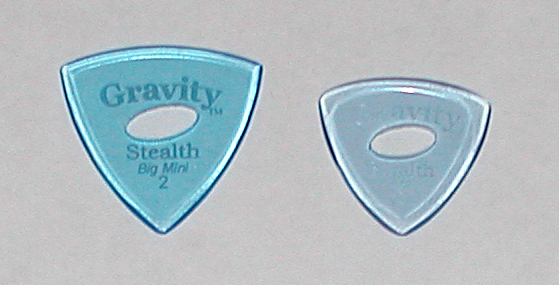 The How To Make Guitar Picks page specifically. I purchased a couple of sheets of clear polycarbonate sheeting from pickpunch.com. One sheet is .50 mm in thickness and the other is .80 mm thick. I didn’t use a pick punch to make these, though. I traced the pick shape on the polycarbonate sheets with a fine tip Sharpie marker and cut them out with a scissors (I tried an Exacto knife, but the scissors worked much better). After the rough picks are cut out the artwork is applied next. 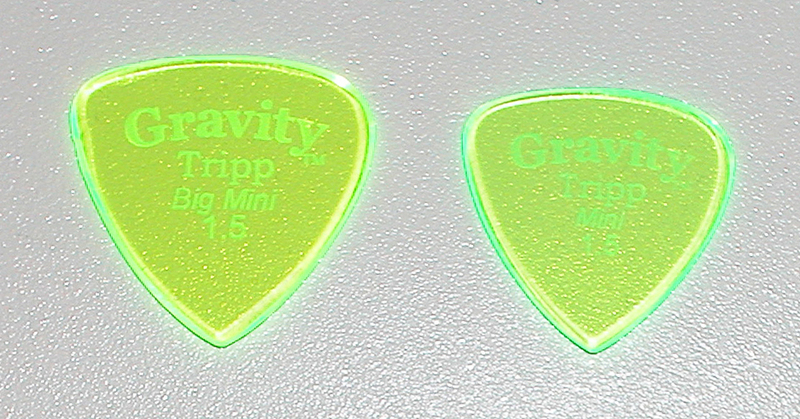 The artwork in the two finished picks above were created with Sharpie markers. The artwork in the two picks below were painted with enamel model airplane paint purchased from a local hobby store. 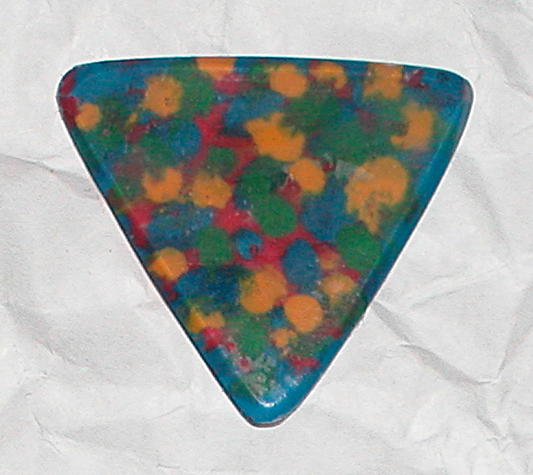 The artwork is literally inside the pick. The artwork will not rub off on your hands as you play. 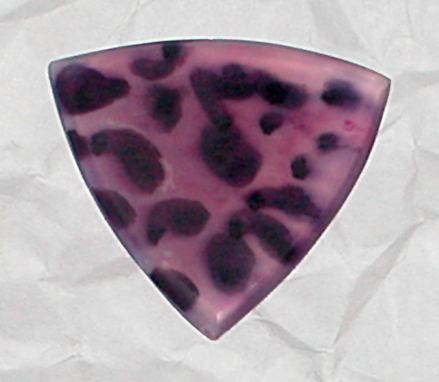 To accomplish this you use two, three or more (depending on how thick you want your finished pick to be) pieces of polycarbonate cut out into the rough pick shape you want. Then apply your artwork any way you would like with Sharpie markers, paint, water slide decals, rubber stamps etc. to only one of the sides if you are using only two pieces of polycarbonate. If you are using three pieces of polycarbonate put the artwork on the piece you plan to put in the middle, and in this case you can put artwork on both sides if you want. 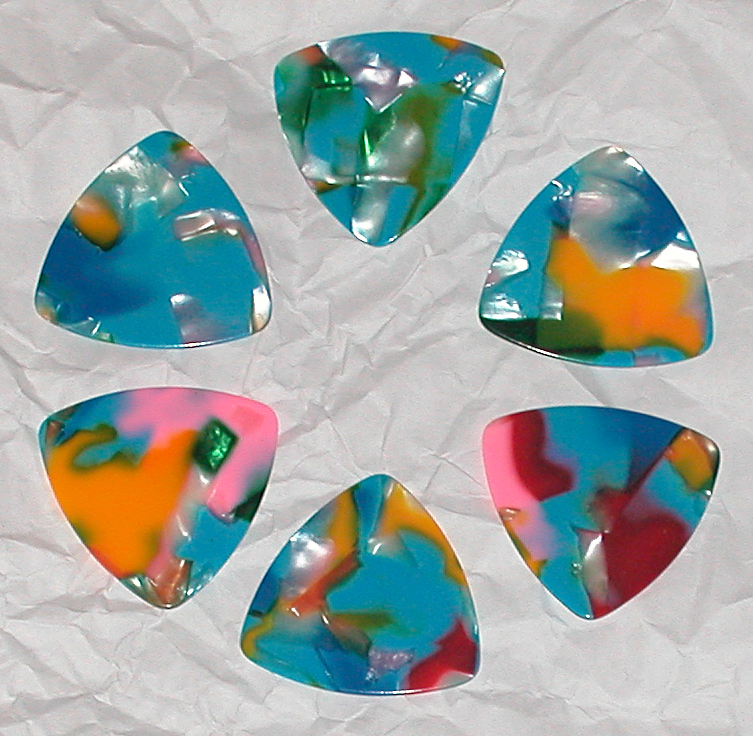 After your artwork has dried you are ready to glue your pick together. Lay the pieces of polycarbonate you plan to glue up on white copier paper or plain old wax paper (I like wax paper better). Then apply super glue to the inside face of one of the pieces if you are using two pieces of polycarbonate, or two interior faces if you are gluing up three pieces of polycarbonate, make sure you are gluing the side or piece with the artwork to the inside to encapsulate the artwork inside the polycarbonate pieces. Make sure you use plenty of super glue. Try to line up the pick pieces as best you can, then squeeze out as many of the air bubbles as possible. Clamp the glued up polycarbonate pieces with a small spring clamp available at any hardware store, and let the whole works dry overnight (if you can’t wait, at least let it dry a few hours before moving onto the next steps). After the glued up picks have dried the real work begins… Lots and lots of sanding. I used a disk sanding wheel with 120 grit sandpaper attached to my hand drill to get the pick shape squared up on the edges. This can be done quite quickly with the disk sander. I sanded off the excess superglue, that gets all over everything during the gluing process, from the two faces of the pick by hand with one piece of sandpaper laid flat on my workbench and a piece of sandpaper wrapped around the handle of a putty knife. That way I could sand off the super glue without taking off too much of the polycarbonate. This way the pick faces would be sanded nice and flat. I used 150, 330, and 400 grit sandpaper to do this. Then I roughed out the bevels on the pick edges using the disk sanding wheel. Then I did all of the detail sanding work using 330 and 400 grit sandpaper by hand on my workbench. I felt that I had better control that way, and didn’t have to worry about taking off more material than I wanted to. I recently purchased 600 grit sandpaper to hone the bevels on the edges a little better before buffing. After the pick has had all of its final shaping completed the next step is to buff the guitar pick with a buffing wheel that attaches to my hand drill like the disk sander. The buffing goes pretty quickly. 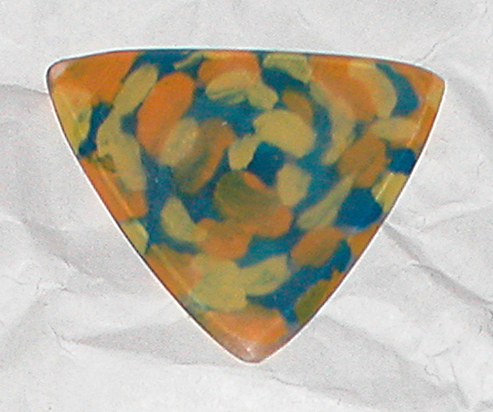 Total time to make one guitar pick like this is about one hour. 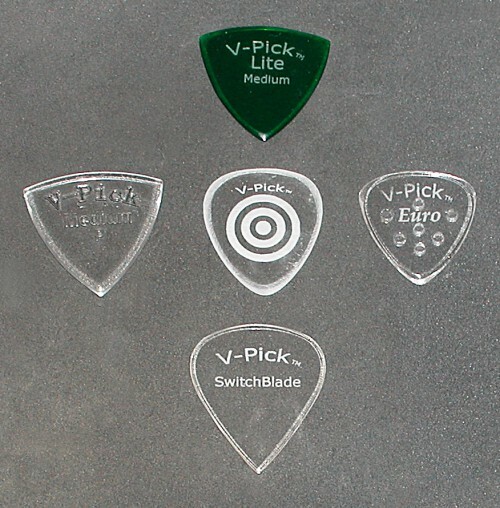 The picks made out of two pieces of .80 mm polycarbonate sheeting are right around 1.6 mm thick when finished and the three piece picks are about 2.0 mm thick when finished. Both pick gauges are very stiff, and sound quite good. The cool thing about this is you can make guitar picks that no one else has and the picks are finished just the way you like them. 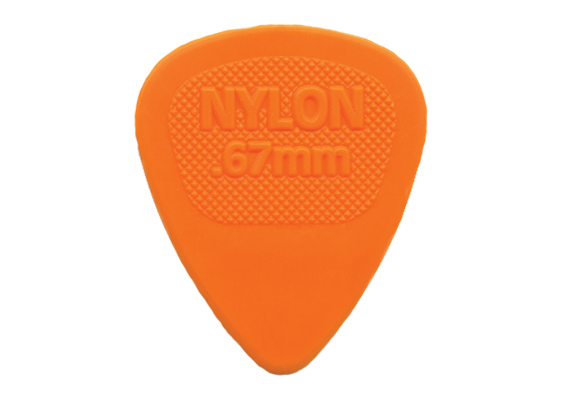 With a nice bevel on the pick, you end up with a guitar pick that plays really well. They will let you play as fast as you can go. The following video to helped me figure out how to come up with the procedure I used to make my handmade guitar picks.